TFCC in cooperation with the other Nordic Chambers held a Breakfast Seminar in Rossini’s restaurant in Sheraton Grande Sukhumvit on May 19th. Mr. Damien A. Lee, Country Manager of Fircroft Thailand was the Guest Speaker on global “Energy Crisis”. His excellent presentation shed light on the effects of current decrease in oil price. The geopolitical outcomes with the US shale oil reserves as well as the importance of China in global energy matters started a lively discussion with the participants in this presentation. 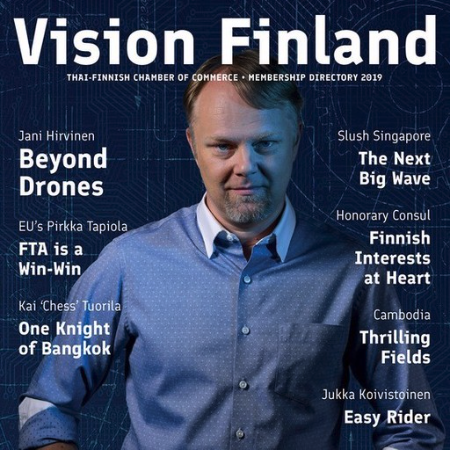 https://thaifin.org/wp-content/uploads/2015/05/nordic-photo.jpg 918 1632 TFCC Editor https://thaifin.org/wp-content/uploads/2015/02/tfcc_logo.png TFCC Editor2015-05-19 15:25:462015-06-25 16:13:59Nordic Breakfast Seminar- "The Energy Crisis"
Finland presented itself to Thailand again. ”We were waiting for this” said the Finnish Ambassador in Thailand, Kirsti Westphalen, in the opening ceremony of the Marimekko store opening in Central World, Bangkok on Tuesday, May 12th. The introduction of the Finnish design icon was also recognised by Kai Tuorila from Finpro: ”Marimekko is a true Finnish design brand and represents our country brand as its best.” Marimekko has realised the growing importance of South East Asia as a lucrative market for its products. The purchasing power of people in China, Hongkong and Taiwan has already been monitored and now Marimekko is targeting for the growing middle class people in South East Asia. Marimekko has already established itself worldwide as a colourful and rich Scandinavian brand with a unique story and history. The new stores now were opened in Bangkok and in Singapore. Marimekko has now over 50 stores in Asia. The legendary Marimekko Executive Mrs. Kirsti Paakkanen said that the poor cannot afford to buy cheap. This suits Marimekko brand well. Marimekko has also established investment value as their branded products are constantly auctioned in Bukowski’s and other auction houses sales representing Finnish design of the 60’ and 70’. The ”Poppy” design of Marimekko can be worn by women everywhere in the world. ”Poppy” embodies the Marimekko story that is widely recognised by the fashion conscious people around the world. Mr. Mika Piirainen, one of the leading designers of Marimekko has created new wonderful designs for Marimekko. These designs enrich the already strong Marimekko brand. Look at Mika’s pants with timeless color and ease – Marimekko brand as its best! Mika has understood how to communicate the Scandinavian design to Asian markets. ”Asia is a challenge, we are different in the way we think as well how we are built” says Mika.” In Japan I learned that people do not like red”. Marimekko is all about color and Thais are not afraid of color. Realising this there should be a good market in Thailand for Marimekko brand. Marimekko is not only bringing its designs to Thailand. You don’t get your purchases in plastic bags when leaving Marimekko store. Marimekko’s thrives in sustainability and ethical consumerism.